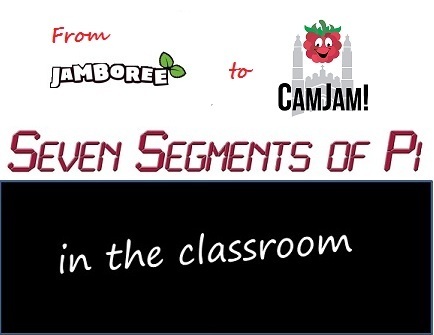 Michael Horne of Recantha who organises the Cambridge Raspberry Jam (known as CamJam) has ask me to give a talk at the May 2014 CamJam about my experiences of running running Raspberry Pi Workshops in schools in Berkshire and Oxfordshire during 2013. In the weeks leading up to the CamJam I shared some of these experiences in a weekly posting on his Blog with the aim of helping others preparing to run Raspberry Pi Workshops in schools. The Blog Series can be found as a series of PDF's below. PART 1 "Yes! ...but what does it do!?" PART 2 "Happy 2nd Birthday Raspberry Pi!" PART 3 "Building the Segments of Pi"
PART 4 "Yes! ...but all our monitors are VGA!" PART 5 "What can you do with just Seven Segments?" PART 6 "Soldering is fun! ...but respect the 300oC end!" PART 7 "NOOBS to the rescue! ...but Mr Hunt I've lost my SD Card!" PART 8 "Count to 10 and Figure Eight My Pi!" Allen Heard ICT Teacher at Bryn Elian High School, Conwy, North Wales has sent me his Seven Segment of Pi Lesson plans and has kindly allowed me to post them here for others to use.